Manufacturer Part Number : -extends spare parts warranty to 5 years"
Home> -extends spare parts warranty to 5 years"
Contex & VIDAR Systems Corporation is known as a leading manufacturer of wide-format scanners for the CAD, reprographics, and GIS markets. Contex & VIDAR Systems Corporation is a leading provider of wide-format scanning solutions for the CAD, reprographics, and GIS markets. 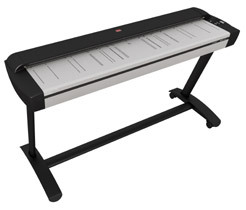 Contex & VIDAR wide format scanners include the Select and Atlas product lines. In addition Vidar is a developer and manufacturer and the global market leader of medical film digitizers. Visit http://www.filmdigitizer.com/ for more information. Our focus is to dramatically improve the processes of companies and organizations worldwide by bringing them high quality imaging solutions and systems. We do this with the support of our company culture, built on a can-do attitude and effective teamwork. Expand your business opportunities with Contex & VIDAR's versatile HD5450 scanner featuring advanced technology and quality imaging for color and monochrome scanning. The large 54" imaging area is designed to facilitate archival and reprographic tasks with a wide variety of large technical documents, detailed maps and drawings, or color posters and architectural sketches - all at the highest resolution and speed. You get exceptional professional-grade performance with 508dpi optical resolution with speeds of up to 12 inch/second. With uncompromising image quality standards, the HD5450 scanner is designed for high-volume productivity for businesses-critical imaging tasks. Whether you are a private business, government or print-for-pay, Contex & VIDAR's range of HD scanners is the right solution for improved efficiency and productivity. Expand your business opportunities with Contex & VIDAR's versatile HD4200 scanners featuring advanced technology and quality imaging for color and monochrome scanning. The 42" imaging area is designed to facilitate archival and reprographic tasks with a wide variety of large technical documents, detailed maps and drawings, or color posters and architectural sketches - all at the highest resolution and speed. You get exceptional professional-grade performance with 600dpi optical resolution with speeds of up to 12 inch/second. With uncompromising image quality standards, the Contex & VIDAR HD4200 series is designed for high-volume productivity for businesses-critical imaging tasks. Whether you are a private business, government or print-for-pay, VIDAR's range of HD4200 scanners is the right solution for improved efficiency and productivity. With uncompromising image quality standards, the VIDAR HD4200 series is designed for high-volume productivity for businesses-critical imaging tasks. Whether you are a private business, government or print-for-pay, Contex & VIDAR's range of HD4200 scanners is the right solution for improved efficiency and productivity. With uncompromising image quality standards, the Contex & VIDAR HD4200 series is designed for high-volume productivity for businesses-critical imaging tasks. Whether you are a private business, government or print-for-pay, Contex & VIDAR's range of HD4200 scanners is the right solution for improved efficiency and productivity. Expand your business opportunities with Contex & VIDAR's versatile HD3600 scanners featuring advanced technology and quality imaging for color and monochrome scanning. The 36" imaging area is designed to facilitate archival and reprographic tasks with a wide variety of large technical documents, detailed maps and drawings, or color posters and architectural sketches - all at the highest resolution and speed. You get exceptional professional-grade performance with 600dpi optical resolution with speeds of up to 12 inch/second. With uncompromising image quality standards, the Contex & VIDAR HD3600 series is designed for high-volume productivity for businesses-critical imaging tasks. Whether you are a private business, government or print-for-pay, Contex & VIDAR's range of HD3600 scanners is the right solution for improved efficiency and productivity. Expand your business opportunities with Contex & VIDARs HD2530 all-round color and monochrome HD2530 scanner featuring advanced technology and quality imaging. Small enough to fit on your desk, yet big enough to handle your toughest archiving tasks - the Contex & VIDAR HD2530 delivers HD quality in an attractively small package. The 25" imaging area is designed to facilitate archival and reprographic tasks with a wide variety of technical documents, detailed maps and drawings, or color posters and architectural sketches - all with unparalleled detail and accuracy. Contex & VIDAR HD2530 handles up to A1 or D-sized originals and documents with ease. With uncompromising image quality standards, the Contex & VIDAR HD2530 is designed to provide dependable, top-quality results for businesses-critical imaging tasks. Whether you are a private business, government agency or high-volume copy shop, Contex & VIDAR's full range of HD scanners is the right solution for improved efficiency and productivity. The smallest of the HD series provides the same high level of quality as the larger HD products. The combination of a highly sensitive high-quality CCD camera with a full-sized professionalgrade camera lens, gives the HD2530 the power to capture higher levels of detail than the competition. Whatever your archival needs are, Contex & VIDAR has the right solution for your business. The HD2530 scanner is the ideal solution for oil/mining industries, clipping services, and is perfect for copy shop/imaging services world wide. Thanks to 48-bit color and CCD imaging quality, the HD2530 is also perfect for desktop publishing and graphics work. 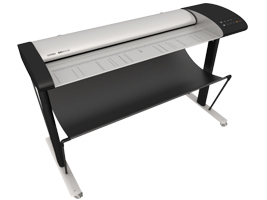 SD large format scanners give companies an easy and affordable way to save time on in-house scanning activities. You get exceptional professional-grade performance with true 1200dpi optical resolution with speeds of up to 10 inch/second. Vidar makes it easy to scan technical documents, maps and drawings. Contex & Vidars SD4400 series is built to withstand high-volume use on daily basis and are available in a sleek and lightweight design. Maintenance and set-up is easy. With SD4400 you get a total scanning solution with leading-edge software that fits with your existing tools and business processes. Instant-on scanning and one-touch interface saves time in loading and scanning large documents. Nextimage software and WIDEsystem drivers make scanning to file, to print, or to the network fast and simple. Intuitive software makes the scanner easy to use and maintain. * Scanning speeds depend on document width and computer configuration. For best performance, VIDAR recommends Intel Core Duo, Core2 Duo, or better processors, at least 1GB RAM, Hi-speed USB2. AVAILABILITY: 9 TO 5 COMPUTER carries a large inventory of New, Refurbished & Used parts like -extends spare parts warranty to 5 years" by . Most products are shipped on the same day as ordered. You will receive a shipment confirmation once your product has been shipped. RE-CERTIFIED: All used products including -extends spare parts warranty to 5 years" by are re-certified by knowledgeable product engineers and are guaranteed to be in excellent working condition.